He was all of 14 years of age when he put on an apron and reported for his term with A. 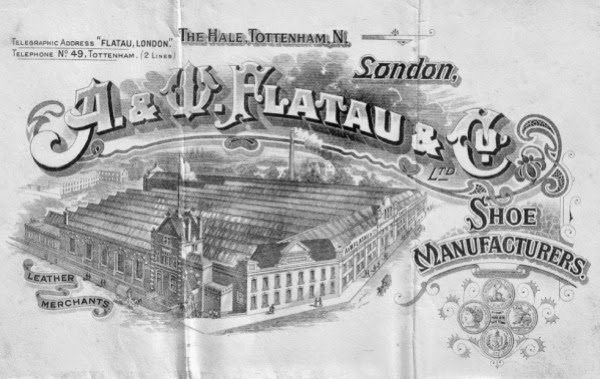 & W. Flatau & Company, LTD., of London. He had chosen the shoe trade and he aimed to learn it from the ground up. This he did, with five years of apprentice training that gave him such a thorough grounding in the art of making real quality shoes that his course has never since be altered. Then I had the opportunity to get a job in another factory where the owner was an Englishman and I got the job there cutting shoes and wasn’t working there very long when the owner sent up with his secretary a note that I should come to his house. He wanted to know what my experience was in the trade. He wasn’t satisfied with the Foreman of that dept. He told me he wanted to make me foreman there, see? He says to start I’m going to make you assistant foreman. He wanted to know whether I could make patterns and I said yes. I learned all that in England. How to make patterns, how to draw sketches and things like that. So he says I let you know whenever I’m ready. Well it took about 4 or 5 months before I heard another word from him. Then they called me down and told me they were going to make me assistant foreman. Well the foreman didn’t like it, so in a few months he quit and I became Foreman. I was very friendly with the other foremen. There was one foreman who was in the packing room, he and another foreman in a factory 2 blocks down the street (DeKalb Ave.) wanted to go into business with this other man named Cohen. He was a foreman in charge of Heeling in that particular factory where he was working in. He wanted to know whether I’d help them pick out the last and make their first patterns for them. I knew all about the layout of the factory. So I said all right. I’ll help you out. I says I’ll make your patterns. I’ll even cut your samples. At that time they were making boots. 9 – 10 inch boots, some with buttons, some laced and it was quite a job to do. You have to draft the last first. See you’ve got so many different style last, high heels, or low heels and the pattern has to be made differently from a lower heeled last than a higher heel, and I did all that. I even cut the shoes. I said you get them stitched and fitted somewhere else. I can’t do no more. They (Sigman & Cohen) rented a small loft. Enough to make 200 pair of shoes a day. I went over there and I laid out the plan for them. Showed em where to lay it out. What to do. What machines go here and what machines to buy there and said you’re on your own. They somehow got lost. They didn’t know what do. Would I come in with them? I said I’ve got no money to go into business. They said we’ll give you some stock and well lend you some money to buy more stock when you come in with us. So I figured it out and finally decided to do it. Chance to break out. I told Mr. Albert I was leaving him. He says I don’t want to stop you from getting on he says but you got a tough road ahead of you, see to build up a factory in these days. I said you took a chance, I said I want a take a chance, and I did. 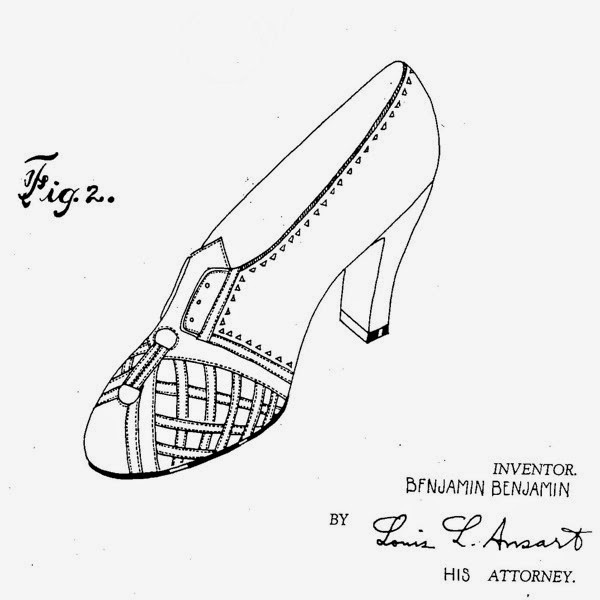 He was a founding partner in the American Shoe Company Schwartz & Benjamin but slowly the Schwartz family took over the company and my grandfather unhappy and not wanting to cause problems between brothers asked to be bought out. It was years before Ben Schwartz finally agreed. 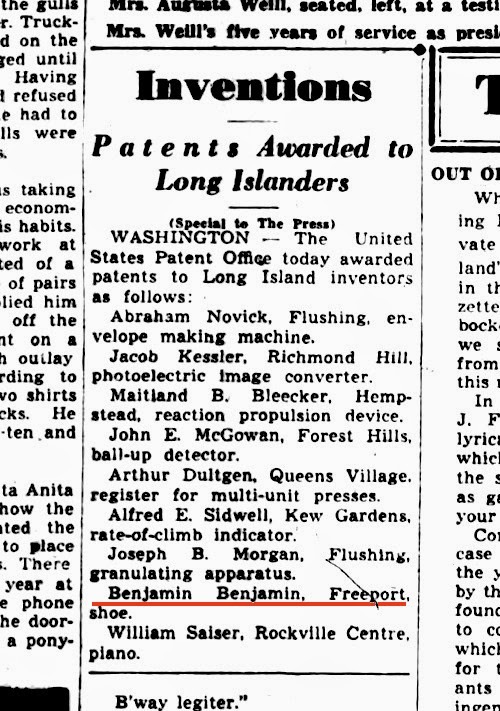 It’s sad that he seems to have vanished from any of the Schwartz & Benjamin company history. When I did a search and found they had just celebrated their 90th anniversary there was little mention of him except in the timeline as a partner. A couple years before I got out, before we moved into New York City. We talked it over, Ben Schwartz & I, about starting a factory out of town instead of NY. See? It was getting impossible to lead the business there because of the unions and their demands. Prices kept on going up higher, and new machinery was coming into place. So people out of town who made cheap shoes could make better shoes than what they were making with the new equipment. So we went. We went to Lynn, and Boston and St. Louis, Cincinnati. We went all around. When I came back we sat down and talked it over. I says Ben, after seeing all the towns, I think Lynn is the best place of the lot. 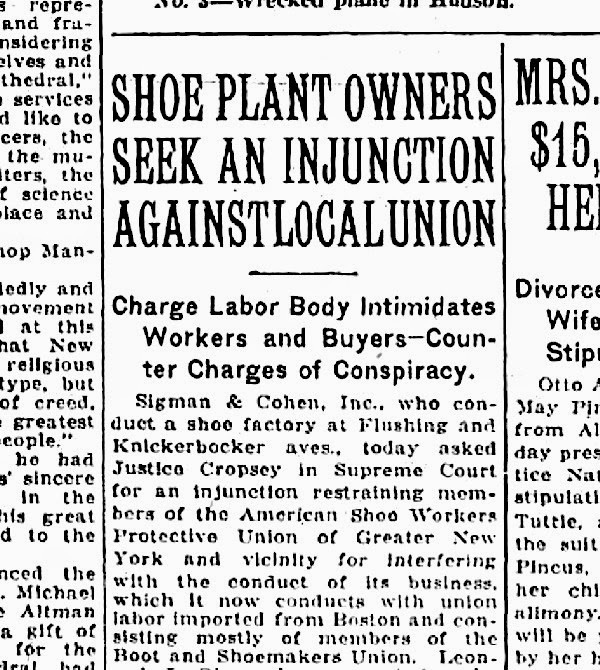 A lot of the shoe factories have went out of business there. 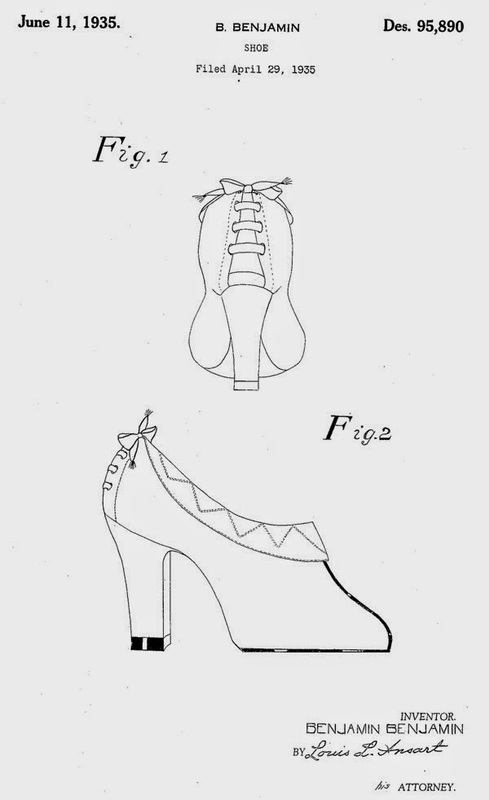 Not good shoemakers like we’ve got in New York, but they could be trained–taught to make better shoes. After I got out, Ben Schwartz did finally go to Lynn. I created a little pump with a certain bow on it…and that’s what kept us busy…Well that little shoe, forget now what the name… we had a name for it…And I kept on creating new things and I’ll never forget one shoe I created. A step in, kind of an open throat, I remember crossing the instep…there was a piece. There was no, no going there but it had a square on one tag and I got a hold of some buttons, brass buttons, some with pearl, with a loop in the back see? And uh…I put 4 buttonholes and I made the leather different on one side to two of the other. I had been sick. I went down to Bermuda for a few days just when the style show was on. Ben Schwartz cabled me in Bermuda. I forget the name of that shoe now. He says the shoes gotten over big, very big. Now I had patented that design but first thing I knew everyone started to copy it. All Manufacturers. But we did a lot with it. You had to sue them and we didn’t have that much money. We were a small company, see? Cost you and dragged on for 2 or 3 years. By the time the trial comes up the style is all gone, over. Wasn’t worth it. After a while I stopped patenting styles. It didn’t pay. My Grandfather told me Ben Schwartz was a bookkeeper by trade and a salesman when a mutual friend introduced them. 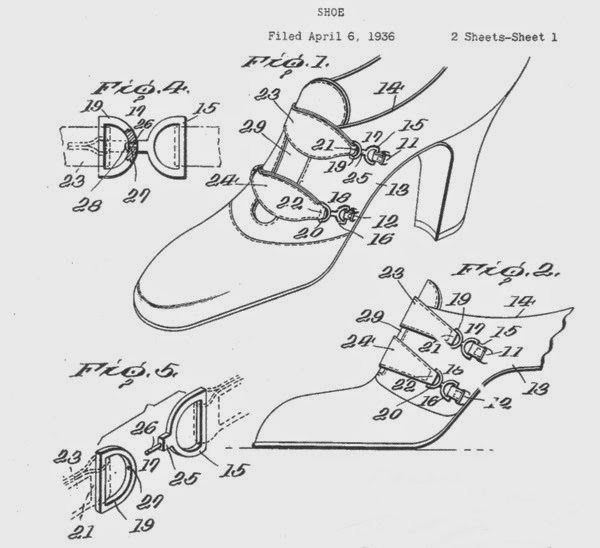 My grandfather was the shoemaker as you can see from the Patent Sketches. 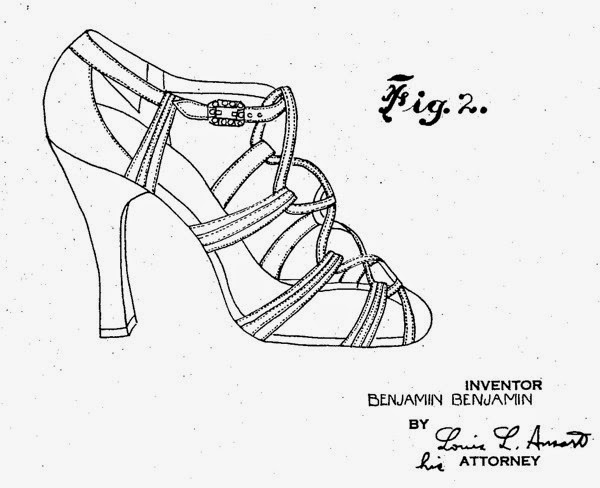 Early on he designed the shoes, made the patterns and laid out and ran the factories.